The El Paso Times (being near Ft. Bliss) has an interesting article on the transition of a Heavy Brigade Combat Team equipped with Bradleys and tanks transitioning to Strykers. Each Stryker brigade has 322 vehicles, which include all 10 variations, said Roy Sayer, executive officer for the Army Transformation Team in Texas. Most of them, 128, will be infantry carrier vehicles, he said. Others setups allow medical evacuations, minesweeping and reconnaissance. In most cases, the weapons can be fired on the move from inside the vehicle by using monitors for targeting. via a blog I’d not seen before, Present Arms, a very interesting snapshot of a small unit action. An infantry platoon in the mountains of Afghanistan gets into a small scrape. Bob Gates and the future Army. Secretary of Defense Robert Gates came out last month with his proposed cuts in various acquisition programs throughout the DoD. The biggest impact this had on the Army was cutting the vehicle procurement portion of the Army’s Future Combat System (FCS) and moving to put most of the networking portion of it on the back burner. First, to both bring all of the army’s combat brigades into network-centric warfare, where using networks to link all combat elements would speed the flow of information, enhance the mental agility of units, reduce the fog of war, and allow our units to out think and outfight enemies large and small. The second goal was to replace the Army’s legacy fleet of heavy armored vehicles, such as the M1 Abrams, the M2 Bradley and the M109 howitzer, with fleets of much lighter vehicles that would be easier to transport to the theater of operations, and more agile on the battlefield. An overriding goal of this part of the program was to use a single common set of components for all the vehicles in the fleet. There are a couple problems with this holistic approach to re-equipping the Army. One, it is technologically very ambitious. Any part of the program that lags behind the anticipated timeline causes almost the whole program to be delayed. And in a program like this, time isn’t just money. It’s a LOT of money. Second, when the FCS program was started, the Army had one vision of what future missions would likely look like. The primary outlook was one of short duration operations against nation/state actors such as Iraq. To say Desert Storm was the model they were working from would be an oversimplification, but it certainly had a large influence. But events since then have shown some of the limitations of that outlook. The vulnerability of lighter armored vehicles to IED attack took the Army somewhat by surprise. Not totally, mind you, but somewhat. In a war of maneuver against a state level enemy, you might expect to lose some forces to mines and other demolitions, but maneuver would mostly allow you to avoid mines, and your agility on the battlefield would prevent the enemy from having enough advance notice of your movements to emplace very many ambushes. That obviously isn’t the case in a counter-insurgency such as Iraq, and to a lesser degree, Afghanistan. When you have to drive through the same neighborhoods on a regular basis, even a fairly dim enemy can figure out where to put mines and IEDs. And given that the FCS goal was for no vehicle heavier than 27 tons, there was no way to provide enough protection against any but the smallest mines and IEDs. As a means of testing this concept of a happy middle ground between the heavy Abrams/Bradley force, and light infantry/artillery team, the Army conceived the Interim Brigade Combat Teams. These are better known as Stryker Brigade Combat Teams, since they are mounted on Stryker vehicles. The Stryker is a modified version of a Canadian designed Light Armored Vehicle, but a key part of the vehicle and brigade design is the integration of its networking capabilities. And it has been quite successful in Iraq. It isn’t invulnerable to IEDs or mines, but the crew survivability is pretty good, and combination of speed, armor and firepower is pretty close to what the Army had hoped for. But even supported by the Mobile Gun System, the Stryker Brigade is a little too light to go on the offense against an armored enemy. But the attempt to force several different types of vehicles, from tanks to artillery, to infantry carriers to share a common basis has not been successful. The challenges, from keeping weight down, to providing enough armor, to finding a powerful, but lightweight engine, are just too much to form a successful program. With the demise of the common family of vehicles from the FCS program, the Army will have to stretch the life of its core fleet of Abrams and Bradley vehicles. They are already somewhat old, most of them having been bought in the 1980s, but with proper funding to reset/upgrade their mechanical components and continued improvement of their sensors and networking capabilities, there’s probably enough life left in them to stave off mass obsolescence. And several parts of the FCS program will be integrated into the Army in the future, such as its great emphasis on UAVs, unmanned ground sensors, and perhaps even unmanned ground vehicles. Certainly, the demand for much greater bandwidth at the tactical level isn’t going to go away, in spite of mounting challenges there (there is only so much of the radio spectrum available). Some technologies, such as the Non-Line of Sight- Launch System are well on their way to being fielded with the Army (and the Navy’s LCS ships will use it as well). Author XBradTC2Posted on May 2, 2009 Categories Afghanistan, armor, army, ARMY TRAINING, ducks, guns, infantry, iraqTags 105mm, Afghanistan, army, army life, ARMY TRAINING, artillery, bradley, guns, infantry, iraq, m-1, missile, tank, tanks, war11 Comments on Bob Gates and the future Army. Who knows why, but our friend KKA likes gunbunnies. Maybe because they’re somewhat gullible. Author XBradTC2Posted on March 25, 2009 Categories army, ARMY TRAINING, gunsTags 105mm, army, army life, ARMY TRAINING, artillery, guns, war4 Comments on Rounds Complete! The Israelis have long sought to manufacture as much of their military hardware as possible at home.There are a couple good reasons for this. First, in the event of an arms embargo, they won’t find themselves without the weapons they need to fight. Having faced more than one embargo, they are somewhat wary of placing any faith in anybody outside Israel. Second, as an export industry, it can be very profitable, once they have an established production base. There are more than a couple countries that have no great love for Israel but have ended up buying military hardware from them. One area the Israelis really wanted to establish some independence in was making tanks. A modern tank takes a lot more work to make than you might think. The armor itself is difficult to produce. You also need powerful engines, the delicate machinery to operate the turret, the precision milling to make the main gun, the specialized electronics and optics for the fire control system and an industry to make the ammunition. After the 1973 Yom Kippur War, Israel got serious about manufacturing their own tank. And based on the heavy casualties in tank crews during that war, one of the objectives was to make crew survivability a priority (the US Army’s design of the M-1 tank was also heavily influenced by the same factors). The result of the development was the Merkava tank. The Merkava was a little unusual in several ways. Unlike just about every other main battle tank in the world, the Merkava had its engine mounted in the front, pushing the turret towards the rear. This provided an extra degree of protection in that if a round penetrated the front armor, it would still have to go through the engine to get to the crew compartment. And because the crew compartment was at the rear of the vehicle, you could put a small entry to the vehicle in the back. By removing some of the ammo racks, you could provide space for a couple infantrymen or extra radios and operators for a unit commander or even put in medics and litters to use the vehicle as an ambulance. Finally, the wedge shaped turret was designed to cause most shells striking it to ricochet rather than penetrate. Over the years, the Merkava has been developed in four main versions. Most of the early versions are being withdrawn from service. Some thought was given to converting them to armored personnel carriers, but as of 2008 the decision was made to build new APCs based on the Merkava 4 design. The Stryker family of vehicles has made the occasional appearance here before. I caught this quick clip on liveleak and wanted to share it with you. It shows the Stryker Mobile Gun System, or MGS firing in support of infantry troops. Just because a vehicle has a big gun, that doesn’t make it a tank. The MGS has a 105mm main gun in a remotely operated turret. This gun is used to provide direct fire support to troops. Indeed, other than being really close to the target, this clip shows just what the MGS was intended for. And while the MGS is far to lightly armored to go toe to toe with enemy tanks, it can also provide anti-tank fires when properly used. See video below the fold. For 60 years, the Army has had a balance between light and heavy units. Heavy units had tanks and armored personnel carriers. Light units had no tanks and depended on foot infantry. Heavy units had great firepower and could move rapidly over short distances. They were capable of taking on Soviet tank and motor rifle divisions in the Fulda Gap of Germany. They had the protection and mobility to survive in a high intensity battle. But the had shortcomings as well. They were handicapped by difficult terrain like mountains and dense forests. They needed a huge supply and logistical tail to keep them running. They had a large percentage of their troops devoted more to maintanence than to fighting. They were expensive to equip and to operate. But worst of all, it was hard to move them from the US to wherever the fight was. As a practical matter, they could only be moved by large cargo ships. Light units, on the other hand, moved on foot mostly, and could operate in terrain that would stop tanks cold. They could be moved by air (in fact, every thing and every one in the 82nd Airborne division could be parachuted into the fight). They required less logistical support and fewer troops were dedicated to maintanence. The biggest part of the light divisions were the 9 infantry battalions and their supporting artillery. But this came at a price. Once you got them into the theatre where the fight was, they were hard to move around. They moved at a walking pace. They didn’t have a lot of firepower compared to a heavy division. The dilema faced by the Army was how to field a force that could be moved to a foreign country quickly, and still have the mobility and firepower inherent in a mounted force. The answer the Army came up with was the Stryker Family of vehicles. The Strykers are an attempt to find a middle ground between heavy and light- a happy medium as it were. The basic vehicle was adapted from a the latest version of a Canadian design from the late 1970s. This is the Stryker ICV or Infantry Carrier Vehicle. As you can see, it is an 8 wheeled armored truck. Wheeled armored vehicles are nothing new. They’ve been around as long as armor has. But in addition carrying a squad of infantry, the ICV has a remote controlled .50 caliber machine gun and a thermal weapon sight, giving it the ability to provide limited fire support. It is also equipped with the latest battlefield network system to give the crew and passengers a clear picture of where they and their companions are on the battlefield. While the passengers can fight while mounted, through hatches above the rear compartment, the ICVs main job is to deliver the squad to the fight, where they will dismount to close with the enemy. The Stryker just doesn’t have the armor to withstand hits from antitank weapons. Its main defense against them is to use its speed and mobility to avoid them. But a fighting unit is more than just infantrymen (as much as it pains me to admit). When the Army bought the Stryker, they bought several versions designed to give supporting units a vehicle that could keep up with the ICVs with the same level of protection and, since they were based on the same vehicle, minimizing the logistics and maintanence needed to support them. There are mortar carriers, headquarters vehicles, a version for combat engineers and an ambulance to evacuate casualties. Since the infantry troops don’t have a lot of heavy weapons to fight tanks, or take out bunkers, the Army developed a special version of the Stryker to provide just a little more punch- The Stryker MGS or Mobile Gun System. This is a Stryker with a special turret mounting a 105mm cannon. The turret is unmanned. The crew of the MGS is in the hull, and controls the turret and the weapons from there. This is NOT a tank. Again, it just doesn’t have the armor to act like a tank. But it does give the infantry a lot of punch when and where they need it. The Stryker has taken a lot of critisism from folks because it has fairly light armor. When compared to a Bradley or an M-1 tank, they complain that it is too light. But the fact of the matter is, the army used to have several divisions of troops that had no armor at all. Compared to riding around in a Humvee, the Stryker is far safer. Sure, the ICV is a total loss, but there was only one wounded as a result of a roadside bomb. I’ve posted previously about the groundpounders favorite plane, the A-10. But that isn’t the only airplane that grunts like. One of the most impressive planes in the Air Force is the AC-130U Spectre gunship. With its incredible sensors and awesome firepower, the AC-130 can put “warheads on foreheads” in close contact to friendly troops. While the AC-130 is the premier close support platform for troops in contact, that isn’t what it was originally designed for. The gunship is a relatively new platform, the first models having been conceived in the early 1960s in Vietnam. 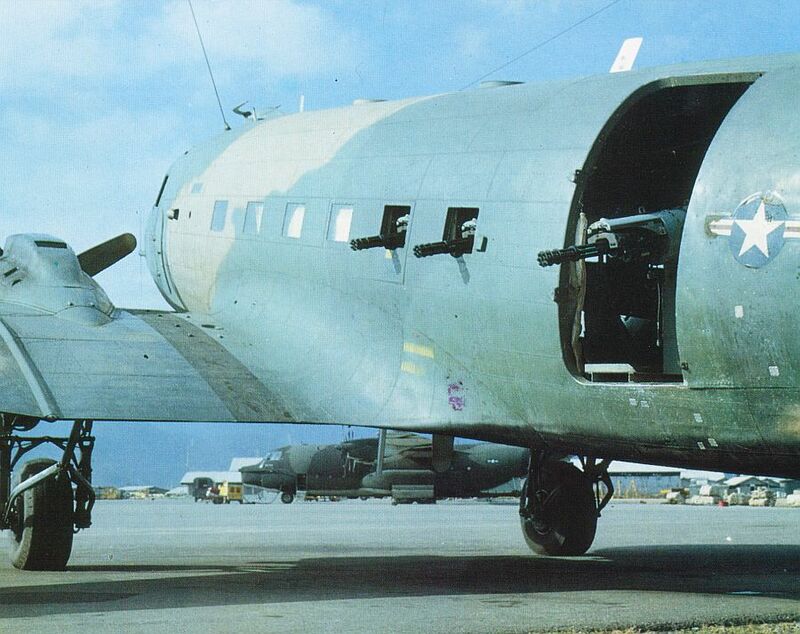 The original gunships were converted C-47 transports. By removing some windows and mounting three 7.62mm Miniguns in the cabin to fire out the port side, the transport was converted to a gunship that could lay a withering fire on enemy troops below. The idea of using side firing guns had a wierd genesis. An Air Force officer met a missionary who had delivered small items to Amazonian tribes by lowering a bucket out of a Piper Cub while doing a “pylon turn.” This was a tight turn around a central point. The effect was to leave the bucket virtually motionless while the plane was moving at 65mph. The Air Force officer figured this would be a good way to aim guns from a troop support. Soon after, the AC-47 was born. The AC-47, aslo known as Spooky, or “Puff the Magic Dragon” worked well supporting the small outposts and Special Forces camps in Vietnam. Its ability to loiter overhead for long periods and lay an incredible curtain of fire on troop concentrations made it perfect for supporting these camps. Puff also carried a large supply of parachute flares to deny the enemy the cover of darkness. It was a cheap, low cost solution to the problem of providing support. Anyone who has seen the John Wayne movie “The Green Berets” has seen Puff in action. As a follow-on to the Puff, C-119s were were modified with 4 miniguns and called AC-119G Shadows. But the Air Force had another problem in Vietnam, one not so easily solved. The North Vietnamese were moving supplies down the Ho Chi Minh Trail virtually unopposed at night, in convoys of hundreds of trucks. Existing fighters and fighter bombers were ill suited to finding and destroying these convoys hidden by dense jungle. The converted transport was the solution. By adding night vision devices, forward looking infrared, and increasing the armament to include the 20mm M61A1 Vulcan, an interim truck hunter was born. This aircraft, the AC-119K Stinger also had two jet engines added to compensate for the much greater weight of the sensors and weapons. The Stinger’s ability to fly low and slow and loiter over the trail made it an excellent truck hunter, but this was still only an interim solution. The ultimate planned gunship had always been based on the C-130. It wasn’t until there were sufficient C-130s in service that a conversion program began to produce what became known as “The Spectre.” The larger, far more powerful C-130 had the load lifting ability to add a far more sophisticated sensor array and a vast increase in armament. 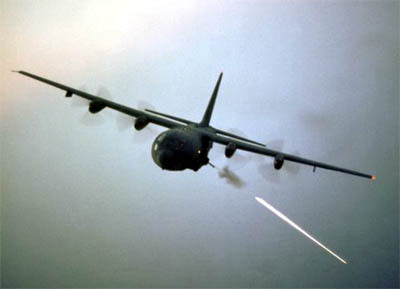 In addition to 7.62mm Miniguns and 20mm Vulcans, the AC-130A had two 40mm Bofors cannons and a whopping 105mm cannon. This was some serious truck busting capability. After the Vietnam war, the need for truck hunting had diminished, but the obvious value of the AC-130 kept it in the inventory to support troops on the ground. Further development has lead to the current model, the AC-130U. The “U-Boat” or “Spooky” is armed with a 25mm Gatling gun, 40mm Bofors, and the 105mm cannon. Some research has been done on adding a 120mm mortar in place of the 105. We’ve covered Explosively Formed Projectiles here. EFPs however, are a relatively small slice of the anti-armor pie. Far more common are the HEAT round and the Sabot. HEAT stands for High Explosive Anti Tank. HEAT rounds are also known as “shaped charges”. Just using high explosives doesn’t do much to penetrate armor. By shaping the explosives in an inverted cone, and usually lining this cone with a copper sheath, the explosive effect can be channeled into a very small spot on the target. This superheated jet of fire and molten copper then “burns” through the armor. While this produces only a small hole in the armor, the fire and copper tend to ignite anything inside the vehicle. Military vehicles are stuffed with flammables (people count as flammables) or explosives, so any penetration of the armor can have devastating consequences. The rule of thumb is that a shaped charge can penetrate six times its own diameter. A 4″ warhead, then would notionally penetrate two feet of armor. * This means that relatively small warhead can provide quite a bit of punch. The first common use of shaped charge warheads was in WWII by the “Bazooka”. To this day, we still see small, man portable rocket launchers all over the battlefield. Common examples are the Soviet designed RPG-7 and the US AT-4. Whereas the RPG-7 is a reloadable launcher, the AT-4 is a disposable, one shot weapon. Anti-tank missiles also almost always have a HEAT warhead. Since the speed of the warhead on impact makes no difference in penetration, relatively slow (hence lightweight) missiles can be used. In US service, both the TOW missile and the Hellfire have HEAT warheads. But missiles and rockets aren’t the only place HEAT rounds are used. Tanks can also fire HEAT rounds. In fact, one of the reasons why the M-1A1 Abrams tank has a smoothbore main gun is that HEAT rounds work better when they aren’t spinning rapidly. Instead, they use pop-out fins to stabilize the shell. The original 120mm M830 HEAT round looked like a coffee can with a probe attached. The probe is designed to detonate the warhead at a set distance from the target, giving the hot jet of gasses space to fully form. To close in, and the jet doesn’t form. Too far out, and the jet loses it’s focus. In the past few years, the M830 was replaced by the M830A1, with a slightly smaller warhead, but with a proximity fuse to allow it to defeat helicopters and other soft targets. While HEAT rounds are simple and cheap, and fairly effective, there are countermeasures. A simple, low cost countermeasure is the cage, seen here on a Stryker Infantry Carrier Vehicle. The cage either prevents the fuse from detonating the warhead, or causes the warhead to detonate too far out to be effective. Explosive reactive tiles can be bolted onto the outside of vehicles as well. These explode when hit by a HEAT round and the explosion disrupts the jet of the warhead.Tanks like the Abrams use composite armor with layers of steel and ceramic to defeat HEAT rounds. Sabot rounds overcome these weaknesses. Sabots, also know as kinetic energy penetrators, use sheer momentum to penetrate armor. In the early days of armored warfare, AP (armor piercing) rounds were solid shot or had a small bursting charge. Basically, they were just big, hardened steel bullets. But as armor grew thicker, AP rounds lost their ability to penetrate armor. The solution was the long rod penetrator. By making the solid shot thinner but longer, the projectile would maintain the same weight while focusing its impact on a smaller area. This improved penetration. To make this thin, dart shaped projectile fit into a cannon, the dart was wrapped in a “sabot” or shoe. These sabots would fall off as the dart left the barrel. There are no explosive in the dart. Just the energy transferred from the impact will generate enormous amounts of heat as it slices through the targets armor. Also, chips of the dart and the targets own armor are superheated and sprayed inside the target vehicle, setting afire fuel and ammo. This quickly leads to the catastrophic destruction of the target. The drawback of a sabot round is that it takes a very big gun (like a 105mm or 120mm) to generate the velocity needed to penetrate armor. This means a big vehicle to mount the gun. The trade off here is that while a heat round can be transported easily, tank takes a lot more logistical support. Also, while sabot rounds have great penetration, they don’t do a lot of damage outside the immediate area of impact. Sabots are of little use in urban combat such as Iraq. Tank crews there are far more likely to use HEAT rounds to engage the enemy. *When we talk about armor penetration, we are measuring against a benchmark of Rolled Homogeneous Armor or RHA. Different armors will have different protections. Two feet of aluminum won’t provide as much protection as two feet of RHA steel.